Thomas Dunne Books, 9781250119360, 288pp. DR. SANJIV CHOPRA is Professor of Medicine & Faculty Dean for Continuing Medical Education at Harvard Medical School, and Director of Clinical Hepatology at Beth Israel Deaconess Medical Center in Boston, Massachusetts. He has approximately 100 publications and 4 specialist books to his credit. He has received numerous awards including the Excellence in Teaching Award from Harvard Medical School. With Dr. Alan Lotvin and David Fisher, he is the author of Live Better, Live Longer. He lives in Weston, Massachusetts. Gina Vild is the associate dean and chief communications officer for the Office of Communications and External Relations at Harvard Medical School. She lives in Boston and is coauthor of Two Most Important Days. 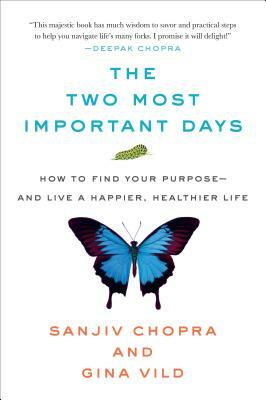 "Sanjiv Chopra and Gina Vild have gracefully woven the wisdom of generations and recent scientific research into a delightfully practical understanding of how each of us can achieve happiness—and, more important, how we can share it with others. You will definitely find yourself saying, 'Wow, I can do that!' And smiling to yourself." "This delightful book will instruct and entertain. I can't think of anyone who would not find this useful; for many a reader it will be life-changing." "Everyone will find warm, down-to-earth, commonsense approaches to making life richer and more satisfying. You will be inspired as you read it cover-to-cover and then return for practical reminders of what you can do today, in this moment, to bring more joy and meaning to your life."